If your teeth look less than perfect, porcelain veneers are the ideal solution to enhance the appearance of your smile. Porcelain veneers are placed on the front of the teeth for a complete smile makeover. Over the last decade, the American Academy of Cosmetic Dentistry reports porcelain veneer procedures have increased by over 200 percent due to the amazing results they create. Los Angeles porcelain veneers from Westside Dental Associates will give you an amazing smile with unbelievable before and after results. Porcelain veneers are dental veneers that are made from porcelain to improve the appearance of teeth. Very thin shells are placed over the front side of teeth to correct unsightly dental problems, such as chips and discoloring. The veneer bonds to the tooth to change its entire appearance, including the tooth’s shape, color, and size. Porcelain veneers are ideal for creating beautiful, vibrant smiles because they resolve a number of appearance issues. Veneers make broken, chipped, and worn down teeth look better, while fixing minor alignment issues and abnormally formed teeth. Since veneers come in all shapes and sizes, they can be used to close gaps between teeth for a straighter, whiter smile. Dental veneers can also come in resin composite, however, porcelain veneers offer extra benefits that resin veneers can’t. Porcelain doesn’t stain as easily as resin, allowing them to stay looking better for longer. Porcelain also produces a brighter smile because light naturally reflects the porcelain surface for a more natural appearance. Porcelain veneers are also thinner than resin veneers, so less tooth is removed to bond the porcelain fronts to the teeth. In addition, gum tissue has shown to tolerate porcelain better for less irritation. Veneers are cared for just as natural teeth and will last 5 to 10 years with the proper care, at which point, the veneers will need to be replaced to maintain a perfect smile. After a consultation by a cosmetic dentist, a treatment plan is established prior to beginning the procedure. During the procedure, roughly ½ millimeter of enamel is removed from the tooth’s surface while under local anesthesia so there’s no discomfort. Then, an impression of the tooth is taken to create customized veneers for a natural appearance. The final stage of the procedure involves bonding the veneers to the teeth for a proper fit. During the bonding process, the teeth are cleaned, polished and lightly scraped to create a stronger bond. A light beam is used to activate the cement chemicals to hold the veneers in place for a shorter wait time. 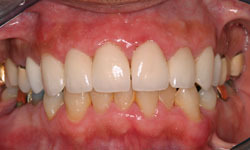 Your teeth are then cleaned to remove any debris or cement and adjustments will be made to correct the bite. Trusted for over 30 years, Dr. Les Latner is the cosmetic dentist in Los Angeles to go to for anyone who wants a smile makeover, and more specifically, porcelain veneers. For a night and day transformation, contact, Dr. Latner for your Los Angeles porcelain veneers. by: Les Latner at February 3, 2016 .